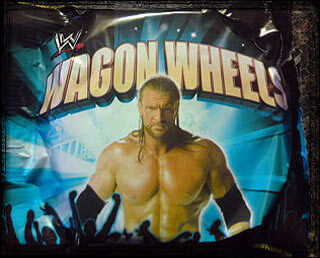 Someone Bought This Classic: WWE Wagon Wheels - WrestleCrap - The Very Worst of Pro Wrestling! Fellow Crapper Aaron Maiden writes: “I bought something stupid. A popular snack in the UK is the Wagon Wheel (http://en.wikipedia.org/wiki/Wagon_Wheels), and in the supermarket recently I saw these. I had to have them. RD: Sorry, but if it doesn’t include Time for Timer, it’s no Wagon Wheel in my book! Time for Timer has finally made it on here. 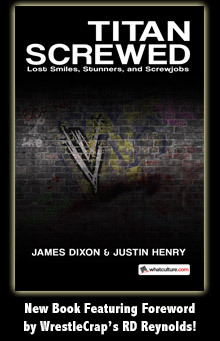 I can now officially close WrestleCrap without any remorse. 14 Responses to "Someone Bought This Classic: WWE Wagon Wheels"
A Time For Timer reference on WC. I can now die a happy man. You could make Wagon Wheels, or you could make Sunshine On A Stick! I’m sorry but that looks like a condom wrapper. Well that certainly would stop me in my tracks! I remember eating a Jeff Hardy one! Did it make you high out of your mind and convince you to wrestle a title match in that state? What’s the difference between a Wagon Wheel and a Moon Pie? Nothing. It’s the same thing. I hanker for a hunk o’ cheese. I like how Timer can’t really sing, so he just speaks to the rhythm of the music. Seriously, was ABC too cheap to find someone who could sing the part? The networks really don’t care about educational programming, do they? This description seems like you shouldn’t eat it if it has Jeff & Chavo on it. The description contradicts itself. It lists five, says there are six, but then relists four of the first five and two others. That makes seven total. Considering the “Superstars” listed, how old are these Wagon Wheels?